Home Coco Martin Enrique Gil event famous stars Julia Montes Kapamilya stars Kathryn Bernardo Sam Concepcion stars starstruck Trinoma Way Back Home Way Back Home Mall Tour The Mall Tour of the 'Way Back Home' Cast! The Mall Tour of the 'Way Back Home' Cast! It was a very fulfilling experience last Sunday, August 14, 2011! "Grabe sa dami ng tao sa two major malls of Quezon City!" It was because grand fans day and mall tour in SM North EDSA and in Trinoma of the two biggest shows of ABS-CBN. In SM North EDSA Skydome, Coco Martin, Maja Salvador, Andi Eigenmann, Martin Del Rosario, and the whole cast of "Minsan Lang Kita Iibigin" were there! Although you need to buy a ticket to watch them, you can't anymore pass through because of too much crowd! And all of them were all shouting and looking for Coco Martin! I didn't anymore push through the Skydome for Coco Martin. I then decided to watch the four main cast of "Way Back Home" in Trinoma! Yeah, "bumalik uli ako sa Trinoma to watch nalang 'ung mall tour nila which is at 6pm!" I arrived in Trinoma Park at exactly 4:30pm. But still, "sobra dami na din ng tao!" Thanks God, there was a vacant seat so the guard allowed to enter in front of the stage! Oh yeah! The show started late at around 7:00pm! When the four young stars namely Kathryn Bernardo, Julia Montes, Sam Concepcion, and Enrique Gil arrived, people keep on screaming! It became too loud when Enrique came! There was a contest in the said show. It was a singing contest! Yeah, you will sing the chorus of the theme song of "Way Back Home" called "You're My Home" infront of the stage! And the prize will be a free picture taking with the four lead cast! "Hobby ko pa naman to have pictures with the stars!" I decided to join sana. But then, "nahiya ako 'cause it was live telecast!" Yeah, there was a camera! So I let the four fans to come on the stage and sing! Hayz...sayang! The four contestants got the chance to have a picture with them! I contended myself then to watch them and took pictures of them! But I got the chance to touch one of the four stars! 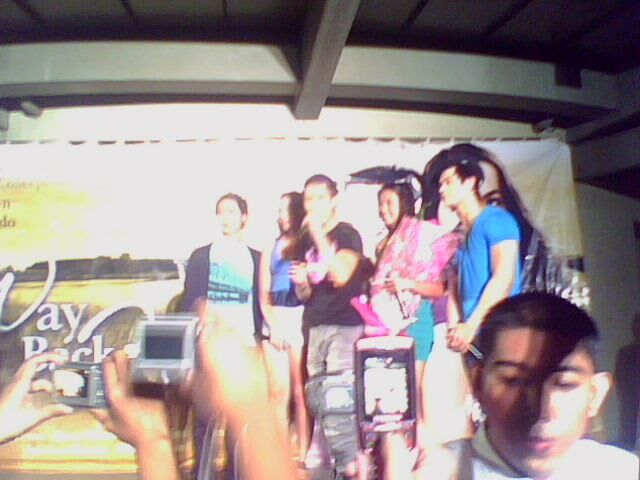 I was able to touch the body of Enrique Gil! Haha! Because during their exit, Enrique was trapped in the crowd! And I was beside him! "Sa sobrang tulakan, nahawakan ko ang katawan at biceps ni Enrique Gil!" I Missed the Kim Hyun Joong Event! Zacapa: A Heavenly Rum Above the Clouds! 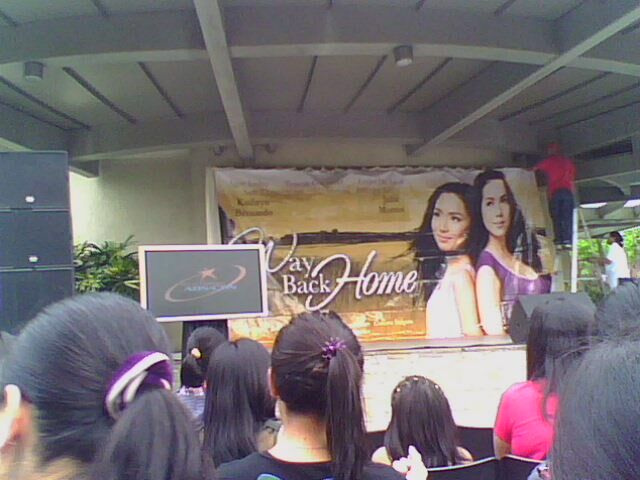 Some Photos of My 'Way Back Home' Experience! The 'Go AZKALS Go' Theme Song! The Christopher Lao Road Sign Warnings! August 2011 - "Capturing The Best Shots!" The Power of Unlimited Mobile!